You don’t ever have to remember to make another window cleaning appointment! We automatically clean your exterior windows; 3, 4 or 6 times per year packages available. No phone tag to get your appointment and priority scheduling. No appointment necessary. You don’t even have to be home. Please contact us for complete details and pricing for your home. 3 times a year auto schedule program discounted exterior surface cleaning. 3 times a year auto schedule program discounted exterior surfaces cleaning. * Active Clients are those who have had service within the last 13 months. NO RAIN SPOTS. We can’t control the weather but we guarantee that you won’t have spots on your glass after your cleaning. If you notice spots soon after cleaning, we’ll be glad to return and remove them. Just give us a call. 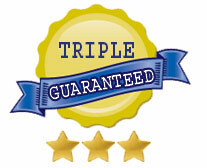 Satisfaction Guaranteed – We’re not happy with our work unless you are satisfied with it. If you would like to receive special offers by email, please fill out the form below. If you Like Us; Like Us Please! The young man you sent was very friendly. He did an efficient, exceptional job. He was very pleasant and even took his shoes off so nothing would be tracked in onto my floors. I will use you again and tell anyone looking for window cleaning about you. Great job! Lee was amazing! He was so friendly and did such a great job. By the time he left it felt as if we were friends. I will definitely recommend your service to all friends and co-workers. It was a great experience.